Walkways, balconies & terraces come in all shapes & sizes ranging from public access walkways linking multiple structures together, public and private terraces on both commercial and domestic properties and individual balconies & terraces within private dwellings. Unfortunately, many are poorly maintained and end up exhibiting a variety of defects which include concrete degradation and spalling to the exposed outer edges and underside (soffits). The top surfacing (the waterproofing element) is designed to give protection to these trafficked surfaces against weather and other elements. Over time, they often become cracked allowing water ingress which nearly always culminates in erosion and substrate damage. An important element of being able to refurbish such areas of structures is the speed at which they can be repaired. 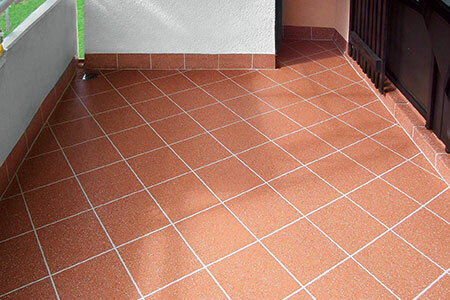 Clearly they tend to require resurfacing at the outset to stop the ingress of water and de-icing salts and provide the necessary levels of slip resistance to reduce the possibility of a person slipping and becoming injured. The downside of this is that the walkway surfaces have to be closed off to carry out the work which can – unless planned properly – cause considerable inconvenience by preventing access to the other linked parts of the structure. The systems that we utilise at Cemplas are all extremely rapid-curing meaning that the surfaces can be re-applied within minimal time so as to reduce the impact of works. Where balconies & terraces are part of the ‘living’ environment – ie when attached to homes and gardens (be they public or private), they become effectively an extension of the interiors of properties so much greater emphasis is placed on design using contrasting colours as well as a range of surface finishes for enhanced aesthetic effect. The systems that we work with are fully compatible with the likes of concrete, asphalt & steel substrates usually meaning that they can be applied directly without having to remove the existing material first. 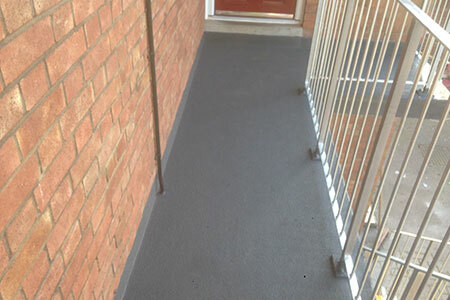 The re-waterproofing systems we apply are based on extremely rapid curing PMMA (polymethyl methacrylate) or PU (polyurethane) resin systems which are cold-applied ensuring that there is NO ‘hot-work’ element. Furthermore, given the speed of cure following application, this can minimize ‘down-time’ and disruption to users allowing areas to be re-accessed within short time periods.